When I first started forex trading, I did not have any knowledge about the importance of monetary policy in forex trading. I discovered it later, when I saw the market moves with the release of statements from central banks and authority of monetary policy, which include the speeches by central bank governors and other authorities of monetary policy. 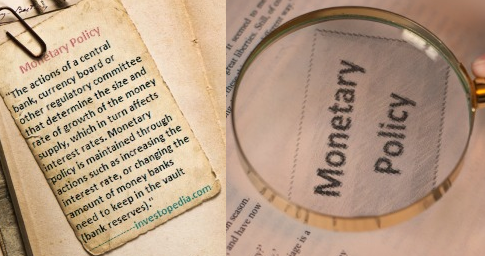 According to the investopedia.com monetary policy is "The actions of a central bank, currency board or other regulatory committee that determine the size and rate of growth of the money supply, which in turn affects interest rates. Monetary policy is maintained through actions such as increasing the interest rate, or changing the amount of money banks need to keep in the vault (bank reserves)." In the above definition by investopedia, the monetary policy action, security/bond purchase, is ignored. The above image illustrates the functions of monetary policy. Money Supply: The total stock of a currency and other liquid financial instruments in an economy for a given period is called the money supply. Inflation: The rate at which the prices of the goods and services are increasing in an economy for a certain period of time. Mentionable, inflation decrease the purchase power of buyers. Deflation: It is the opposite of inflation, so rate at which the prices of goods and services are decreasing in an economy for a given period is called deflation. Interest Rate: The percentage of principal is charged by the lender to the borrower is called interest rate. Bank Reserve: The amount of currency deposits that are not lent out to the bank's clients or deposited with the central bank. Buy or Sell Security/Bond: Central bank buy or sell government security/bond to control the inflation. If the monetary policy is simply explained, we see when an economy has lower inflation or money supply and poor economic performance, the authority of monetary policy decreases the interest rates or/and increases security/bond purchase or/and decreases the bank reserve requirement. The authority of monetary policy takes these steps to increase the money supply or inflation in the economy. The main objective behind the increase of money supply is to improve the economic performance of the country or economy. If the money supply or inflation increases in the economy, people will have easy funds to run the business at lower cost. This will increase the economic performance of the country. On the other side, when the economy has sound performance, the central bank will again increase the interest rate or/and decrease security/bond purchase or/and increase the bank reserve requirement to decrease the inflation. In one sense, inflation is not good for an economy because it decreases the purchase power of customers or increases the price level of general goods and services,but in other way, inflation is good for economic development because it improves the production. In forex trading, traders should keep close look at the monetary policies of the currencies. Monetary policy determines the long term trend of a currency pair.This post just an introduction to monetary policy. In our next posts we will explore the monetary policy in details. If you have any suggestions, please drop a comment below.